Bunnahabhain translates as “mouth of the river” from the gaelic, the river in question being the Margadale which flows into the Sound of Islay near to the distillery. Although generally known as a lighter style of Islay with less peat-smoke this expression bucks the trend. To the nose there is obvious full peatiness with earthy, herbal and tobacco qualities. The mature palate is quite muscular with smoky, peppery infusions and the initially quieter fruity notes developing nicely. A dry, lingering smoky finish rounds off events. 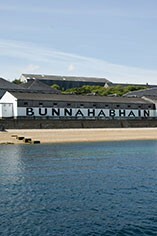 Bunnahabhain is is an Islay distillery that was established in 1881. Pronounced 'Boo-na-ha-ven' and meaning 'mouth of the river', Bunnahabhain is accessible by way of a winding lane off the main road to Port Askaig. Its distillery is set around a courtyard in a style that resembles a Bordeaux château. Despite expansion in 1963 the distillery is little changed. Bunnahabhain is sometimes referred to as "the Islay whisky without the Islay character." Due to it being less peaty than other Islay malts, its light colour (for an Islay) is attributable to the fact that the spring water is drawn before it runs "over and through" the well-known Islay malt. This quality is further enhanced by the distillery practice of taking only a very narrow cut from the second distillation. The distinctive oiliness of the Bunnahabhain malt is due to the short-necked stills utilised. Bunnahabhain is described as being sweeter than the other Islays, with a smooth initial palate and long full finish. Lighter than the Islay style, with a full round flavour. In most instances, Bunnahabhain Single Malt is made of malted barley that has been dried using a fuel source other than peat so as not to impart any smoky, medicinal, iodine-like flavours. On occasion, Bunnahabhain produces batches of a spirit made of barley that has been imbued with the pungent (some would say acrid) smell of peat-smoke as it was drying. The whisky region of Islay (pronounced eye-lay) is arguably the most important 200 or so square miles in the whisky world. On the face of it Islay just another island of the Inner Hebrides. It lies in Argyll just to the west of Jura and around 25 miles north of the Irish coast, which can be seen on	a clear day. The island's fame as far as whisky goes is due to the 8 distilleries currently in production and the vast tracts of peat that cover most of the island's surface. The whisky distilleries are: Ardbeg, Bowmore, Bruichladdich, Bunnahabhain, Caol Ila, Kilchoman (this is the newest distillery on the island which started producing spirit in 2005), Lagavulinand Laphroaig. The 8 distilleries with whisky for sale can be divided up, depending on the amount of peat used. The `big 3' are Ardbeg, Lagavulin and Laphroaig who all produce powerful smoke laden whiskies. The new malt produced by Kilchoman is also very powerful indeed. Occupying the middle ground are Bowmore and Caol Ila. The whiskies produced at Bruichladdich and Bunnahabhain are in peat terms at least, the lightest. There were more distilleries in the past: Port	Ellen closed in 1983 while the Lochindaal at Port Charlotte closed in1929. The buildings at Port Ellen are however still in use, it is here that malted barley for the island's distilleries is produced.